managing and selling email security services. must evolve their portfolios of products and services to remain relevant partners to organizations, and Cybersecurity should remain a high priority. A PERFECT FIT FOR SERVICE PROVIDERS. The great skillset of Service Providers, their ability with communications networks, and especially their proximity to customers, make Service Providers especially fit to provide carrier-grade systems and value-added managed services on the Cybersecurity market. The permanent relevance of Email in organizations, affected by the increasing security concerns associated with phishing, data leakage, and privacy protection, among others, pushes Service Providers to provide Email Security on top of the existing email infrastructure. Preferably, with an Email Security service robust enough to build trust on organizations, while becoming a value added service for the cloud platform itself, as well as hosted Service Providers and Resellers. Multitenant Email Security makes boutique MSSPs sticky. providing security across all organizations under the same MPS Service. MPS’ multitenant architecture allows service providers to offer, from their on-premises clusters, email security SaaS solutions directly to their end customers and/or via hosted resellers, therefore expanding their portfolio and their OEM/ sales channel. 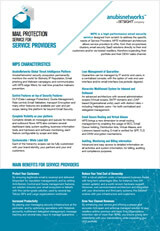 MPS’ multitenant architecture allows hosted service providers to offer, using a third party shared cloud, email security SaaS solutions directly to their end customers or even other partners, therefore expanding their portfolio and their OEM/ sales channel.